bbc.comRafael Nadal would love to surpass Roger Federer's men's record of 20 Grand Slam titles but says he is not "crazy" about catching his great rival.World number one Nadal won his 17th major by lifting his 11th French Open title on Sunday, beating seventh seed Dominic Thiem 6-4 6-3 6-2. "Of course I have ambition. But I can't always be thinking of more," he said. "I've never been crazy about this kind of stuff. You can't live with that feeling. You have to do your way. "I'd love to have 20 like Roger in the future or more, but it is not something in my mind. I know I've had an amazing career so I want to keep fighting for these things." Nadal was emotional when he picked up his 11th French Open trophyIn a rare show of emotion, Nadal looked close to tears as he collected the Coupe des Mousquetaires again after beating Austrian Thiem.He said it was because he had started the clay-court season with "some doubts" before going on to win a record-extending 11th title at Roland Garros.Nadal did not play for more than two months after the Australian Open in January - where he withdrew from his quarter-final against Marin Cilic because of a hip injury.He pulled out of planned appearances in Acapulco, Indian Wells and Miami before returning at the start of April for Spain's Davis Cup tie against Germany.It was his only appearance before winning the Masters title in Monte Carlo in April, backing that up with victory at the Barcelona Open and another Masters title in Rome. "I had a lot of months with injury problems, so coming back to win is very special," he said. "I came back from five months without playing a full tournament. "So coming back and having the chance to win in Monte Carlo, Barcelona, Rome, and now especially here, it's very emotional for me. "I arrived so-so, with some doubts about this clay-court season." 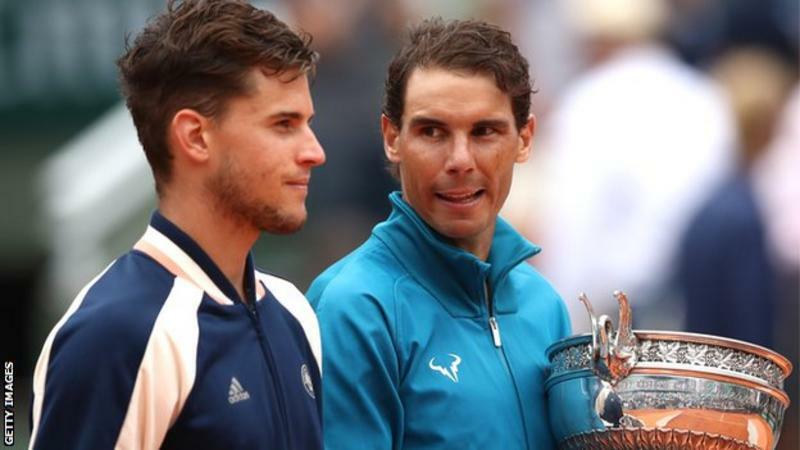 Dominic Thiem was playing in his first Grand Slam finalThiem says he is "confident" his first appearance in a Grand Slam final will not be his last.The 24-year-old finally reached the Roland Garros showpiece after losing in the semi-finals in 2016 and 2017. "That's my biggest goal, to get into the next one and then to do it better than today," he said. "Of course it's going to be easier, a little bit, because it's not going to be the first time anymore. "Thiem is the only player to have beaten Nadal on clay in the past two years - winning in best-of-three set matches in Rome and Madrid.However, he fell to a third successive straight-set defeat by the Spaniard at the French Open.Thiem lost to Nadal in the second round on his Roland Garros debut in 2014, then again in last year's semi-finals. "I think it was the first time against him here in Roland Garros where it was a fight," said Thiem, who told Nadal he remembered being 11 years old and watching the Spaniard win his first title in 2005. "Honestly, I never expected that one day I would play the finals here so I am still really happy. "Winning 11 times is definitely one of the best things somebody ever achieved in sport." Indian cricket legend Sachin Tendulkar was among those to praise Rafael Nadal's victory on TwitterAmerican 12-time Grand Slam singles champion Billie Jean King: Incredible! Congratulations, Rafael Nadal #championGerman six-time Grand Slam winner Boris Becker: The legend continues... Rafael Nadal @rolandgarros #11American seven-time French Open winner Chris Evert: Two warriors won at Roland Garros this year... fighters, grinders, with heart and passion...congratulations Simona Halep and Rafael NadalAmerican former player Pam Shriver: Bingo legs eleven Rafael Nadal. Chasing RF!Ex-Real Madrid and Portugal footballer Luis Figo: Congratulations!! Enhorabuena 11x winner Roland Garros. Amazing!!! One of the best sportsman of all times.Spanish golfer and 2017 Masters champion Sergio Garcia: 11 @rolandgarros for Rafael Nadal!!! Amazing!! What a machine!! Enorme Rafa! !